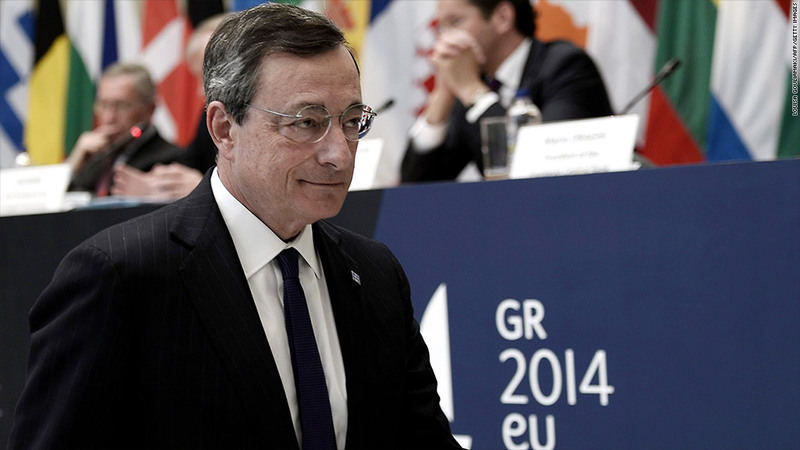 ECB President Mario Draghi was in Athens this week. Greece is one of a handful of European countries where prices are falling as companies seek to restore competitiveness. Negative interest rates? Printing money? They're now both firmly on the agenda in Europe if prices don't start to pick up soon. European Central Bank President Mario Draghi said the bank kept interest rates unchanged Thursday because a sharp fall in inflation in March could be reversed in April due to stronger demand for travel and other services around the Easter holiday. But the ECB was ready to act swiftly if the outlook deteriorates, Draghi made clear. At their meeting, policymakers discussed the merits of negative deposit rates -- effectively charging banks to hold excess cash with the ECB. They also debated quantitative easing, or Fed-style asset purchases. "The governing council is unanimous in its commitment to using also unconventional instruments ... to cope effectively with the risks of a too prolonged period of low inflation," Draghi told reporters. Calls for action to stimulate the European economy grew louder this week after eurozone inflation fell to 0.5% in March, its lowest level since November 2009. The bank targets inflation of just below 2% in the medium term. New surveys of purchasing managers published Thursday suggest the region's economic recovery remains intact, with activity expanding for the ninth month in a row. But they also reflect the intense pressure on companies to cut prices in the face of anemic growth and an unemployment rate that has barely moved from its crisis peak of 12%. The International Monetary Fund, among others, continues to warn that a prolonged period of very low inflation in Europe could suppress demand and jobs, creating an obstacle to an acceleration in the global economy. "More monetary easing, including through unconventional measures, is needed in the euro area to raise the prospects of achieving the ECB's price stability objective," IMF Managing Director Christine Lagarde said Wednesday. Related: The ECB's hard call: More stimulus? Some economists said April's inflation number had assumed even greater significance given Draghi's remarks. "No clear rebound in the inflation rate would imply a very high probability of policy action at the subsequent meeting in early May," said Ken Wattret, chief European economist at BNP Paribas. A strong euro isn't helping. The currency has climbed steadily over the past 12 months, touching its highest level since October 2011 last month. That's making life harder for the region's exporters and adding to downward pressure on prices by cutting the cost of imported goods. Draghi said the ECB was paying ever closer attention to the euro, and its potential to destabilize prices. "Any further downside surprise [on prices] could first trigger a rate cut and, if the shock is very serious, even asset purchases," said Berenberg economist Christian Schulz. A eurozone asset buying program would need careful design and would look rather different than Federal Reserve QE, Draghi said. That's because the region relies on banks -- rather than bond and equity markets -- to finance companies. Draghi's remarks were viewed as increasingly dovish, and the euro slipped 0.3% against the dollar.